Lock in a great price for Old Posting House - rated 9.2 by recent guests. Nice food , excellent shower , very clean . Will stay again . Great home comfort food. Lovely staff and clean and welcoming environment. Could sit in the lovely and well stocked bar all night. Easy to find, amazing views, lovely staff. Welcoming and cosy. Great value. Great place to take dogs. Very accommodating owner. Great place to have an evening meal. 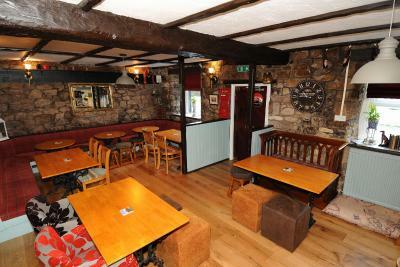 The staff were friendly and the beer and food good, which together with a comfortable room made for an enjoyable stay. The bonus for us was a large car park, where we could park a trailer. Great location, great value, comfortable rooms, great Staff, excellent food, I could not have asked to find anywhere better. Thank you! Excellent service with a fantastic manager. Great location. Very comfortable. Really enjoyable stay, great service and food. 5 minutes to Cockermouth and 20 to Keswick but great to return in the evening for a drink and meal in the bar. Excellent service. Food was very good value for money. Would definitely stay there again . Highly recommend. A 400-year-old coaching inn, just 3.6 miles from Cockermouth, the Old Posting House offers traditional bed and breakfast accommodation, views of the Fells, free Wi-Fi and free on-site parking. The rooms feature flat-screen TVs and king-size beds. All rooms have an en suite bathroom with a shower. The restaurant serves traditional British dishes, including a full roast Sunday lunch. The bar serves real ales and local beers as well as wines and spirits. Period features including the old post boxes and beamed ceilings have been carefully preserved. The Old Posting House guest house is 10 minutes from Lowes Water and 25 minutes from Keswick and Derwent Water. The seaside is a 20-minute drive from the inn. This property is also rated for the best value in Cockermouth! Guests are getting more for their money when compared to other properties in this city. Old Posting House has been welcoming Booking.com guests since 23 Jul 2010. When would you like to stay at Old Posting House? House rules Old Posting House takes special requests - add in the next step! Bankcard Old Posting House accepts these cards and reserves the right to temporarily hold an amount prior to arrival. Old Posting House accepts these cards and reserves the right to temporarily hold an amount prior to arrival. Room we were in had two windows with light coloured blinds, traffic was consistently noisy until approx 2 am and the head lights lit up the room. Breakfast was served 8-9 on a Sunday and check out was 10.30 which is quite early. Breakfast. Poached egg on watery soggy thin toast. Bread/toast needs to be of a decent thickness, not the thinnest that you can buy! I put this comment on last year but nothing has changed! Beautifully refurbished - hadn't been since new owners took over. What an improvement! Dining area looking good and bedroom was gorgeous. Bathroom a bit on the small side for a tall person! In the room we had ( no1 ), ceiling was slanted which spoiled the room slightly. Clean, comfortable and friendly atmosphere. Food all very tasty and well presented.